The greatest American painter of the frontier, Frederic Remington, has a number of relatively unknown paintings being exhibitied at the National Gallery The focus in this show is on Remington's paintings that take place at night. Remington's nocturnes are filled with color and light�moonlight, firelight, and candlelight. These complex paintings testify to the artist's interest in modern technological innovations, including flash photography and the advent of electricity, which was rapidly transforming the character of night. 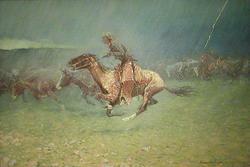 The paintings are also elegiac, for they reflect Remington's lament that the West he had known as a young man had, by the turn of the century, largely disappeared. Although immediately recognized as extraordinary works, Remington's late nocturnes have never before been the subject of an exhibition. Frederic Remington: The Color of Night gathers together for the first time the finest of these mysterious, often deeply personal paintings.